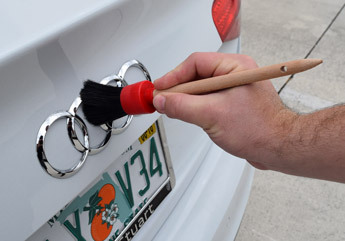 The Famous Detailing Brush is aptly named because it will quickly become famous among your detailing buddies. Our Famous Detailing Brush features a wood handle that’s been sanded down for a smooth finish. The feathered bristles are made out of pig hair for a gentle, yet effective touch. This simple yet efficient tool will make just about any detailing task easier, from exterior to interior care. Where the Famous Detailing Brush really excels is wheel cleaning. 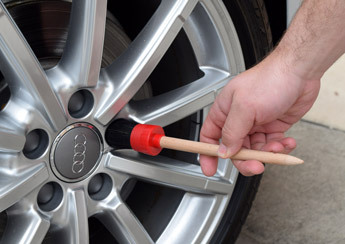 Use it for cleaning hard to reach areas on your wheels, like the lug nuts and brake calipers. The bristles are firmly attached, so the brush will never shed. The feathered bristles remove stubborn brake dust deposits with less agitation than other brushes. Experience the easier side of fine detailing with the Famous Detailing Brush. 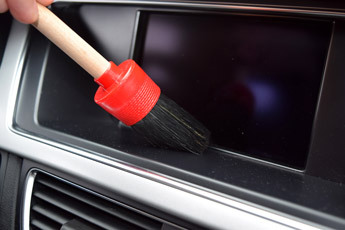 Tip from the pros: Dedicate a Famous Detailing Brush for exterior cleaning and one for interior cleaning. This helps prevent cross contamination.